This recipe comes from Jamie’s new 30 Minute Meals book which we were sent recently. It’s always the pasta recipes that catch my eye when paging through Jamie’s books and, having highlighted this one and with no plans for dinner, it seemed like a good option for a rainy Tuesday night. 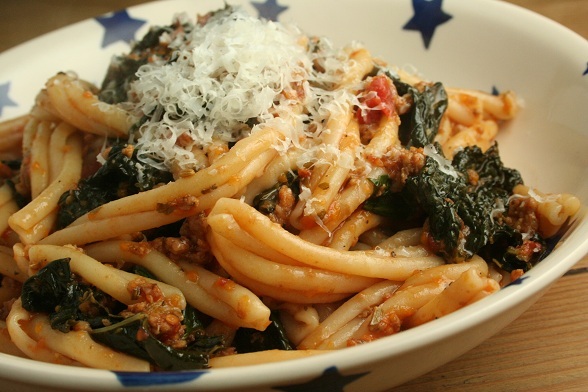 I actually saw him cook this on TV recently and I think we followed the recipe quite closely (apart from the addition of some cavolo nero at the end). He mentioned that this is the kind of dish that tastes as if you’ve cooked it for a long time and one of the things that help with that (apart from the browning of the meat) is the addition of the balsamic vinegar. I don’t like balsamic vinegar very much so was slightly worried about using it and, as it turned out, I think we probably added too much. It was pretty good though, I especially liked the combination of the pork and fennel. Fennel isn’t something I would have thought of adding to a ragu for pasta but it worked well and I’m keen to try something similar again. Just with less balsamic vinegar. There’s actually quite a few recipes that I like the sound of in this book and I’ve taken it to work and left it on my desk. It seems like just the thing to have around when you don’t have a plan for dinner and need some inspiration before picking stuff up on the way home. Subscribe to comments with RSS	or TrackBack to 'Jamie’s Sausage Pasta'. I liked the look of this one when he made it and had snagged from the book to make too, personally I love balsamic vinegar but the other half ain’t so keen so will go easy on it! .-= Anne´s last blog ..Chickpea fritters with Minted yoghurt dressing =-. I hope you like it Anne. Balsamic vinegar can be a bit like Marmite can’t it?